President Trump has noted that he will “make it up’ to U.S. farmers who may be affected by a trade dispute, which are likely to decrease demand and prices for U.S. agricultural products. Incidence of this subsidy is going to fall on tax payers and U.S. consumers in two ways: through increased tax outlays and higher food prices. If the subsidies are also production-distorting, they are likely to invite additional retaliations from other U.S. trade partners. 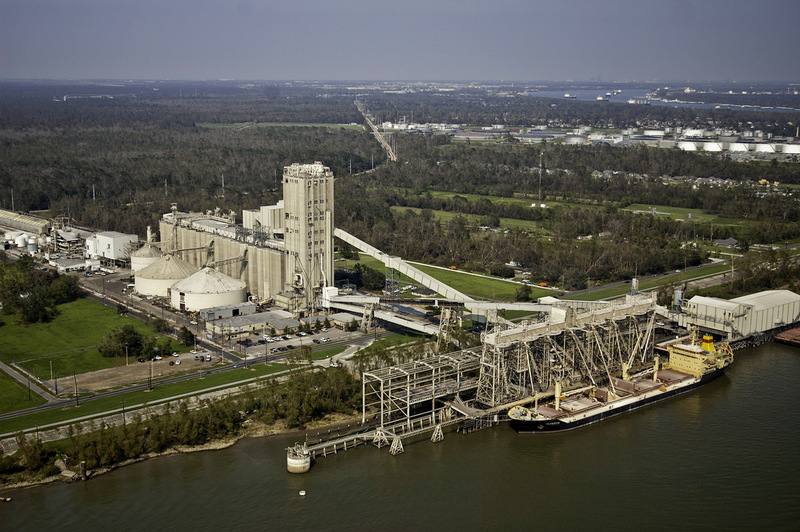 In early-April 2018, President Trump noted that if a trade dispute resulted in losses to U.S. farmers—through potential lower demand and lower prices—a possible solution to aid this sector would be an implementation of additional subsidies. In the current world of news cycles and information dissemination, news from April may seem obsolete and irrelevant. Except that after the initial $50 billion tariff imposition on Chinese goods on July 6 and additional promise of another $200 billion in tariffs announced just last week, the U.S. agricultural sector has begun to see the first actual signs (e.g., lowest Chinese import demand for soybeans since 2004 and the lowest soybean prices in nearly a decade) of the ramifications that economists have warned about for numerous months. If the Chinese trade dispute continues and changes of others (with the European Union and NAFTA partners) grow, the likelihood of seeing President Trump’s additional agricultural subsidies may also begin to increase. But, who pays for those subsidies? And will U.S. producers really be just as well off as before the trade disputes occurred? Let’s start with a brief overview of the economics underlying a tariff imposed on exported U.S. goods, similar to the retaliatory tariffs placed by China. 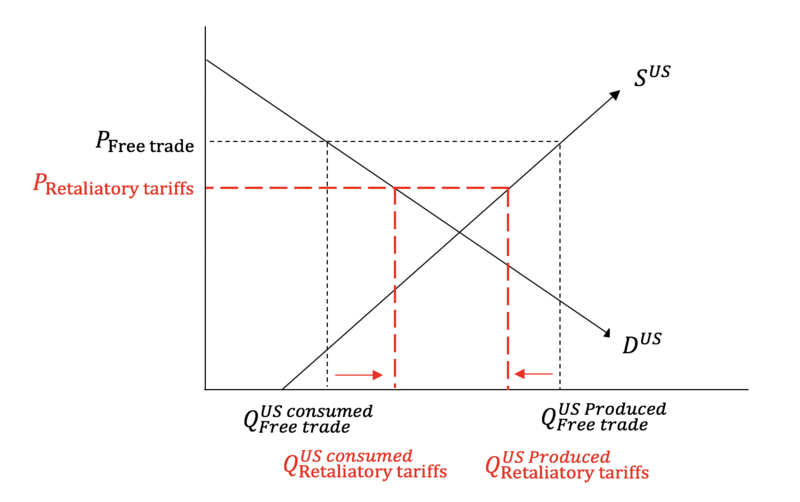 The figure below shows the classic supply and demand diagram with the initial price (in black) under “free trade” (it’s not truly free, but it represents the price before the retaliatory tariffs). At this price, U.S. farmers produce a certain amount of food, with part of it sold domestically and the rest exported. After the retaliatory tariffs, the price drops (shown in red). As a result, U.S. farmers would be worse off, indicated by the fact that they produce a lower quantity and sell at a lower price, while U.S. consumers would be somewhat better off, because they would face lower prices and increase their quantity demanded. The consequences of retaliatory tariffs are fairly intuitive and have been discussed quite a bit in the popular media and, of course, in more disciplinary outlets. However, what happens if President Trump follows through with a subsidy to U.S. producers to counteract the losses that they may incur as a result of the retaliatory tariffs? 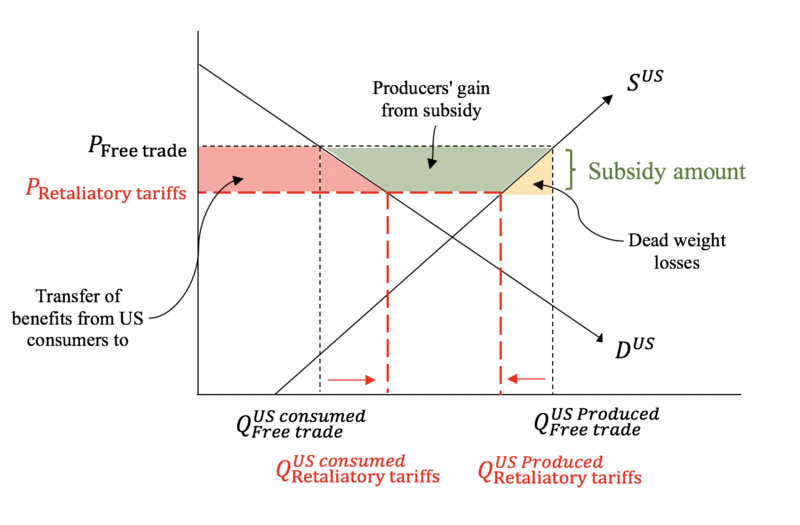 Putting aside the politically-dangerous (if not completely impossible) notion of setting a price floor (a minimum price below which food cannot be sold), the figure below shows one such scenario, in which a subsidy that would be paid to farmers would fully offset the losses they would have observed if the price fell from the initial “free trade” price and the lower “retaliatory tariffs” price (certainly this is simply theoretical, because it may not even be possible to exactly measure the full impacts). The good news would be to the farmers, as they would gain back their entire benefit of producing and selling at the free trade price; in the figure, this “producer surplus” is represented by the red and green shaded areas. But at whose expense? U.S. tax payers and food consumers (i.e., everyone). First, the total subsidy amount—represented by the red, green, and yellow areas on the graph—would be funded through government tax revenues and may require reallocation of funds from other government programs. Additionally, what the subsidy would essentially do is raise the market price back to the “free trade” level, which would result in U.S. consumers seeing higher prices than should be observed when retaliatory tariffs are in place and, consequently, reducing their quantity demanded. Furthermore, tax payers would also take on the costs of the small yellow portion on the graph, which are the “administrative” or “dead weight loss” expenses of implementing this subsidy. Of course there are also questions of how to implement such programs. 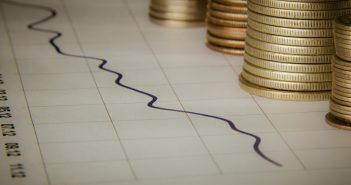 One way would be the proposed use of emergency Commodity Credit Corporation funds, last used during the Great Depression to provide aid to the U.S. agricultural sector (a scenario described above). This would likely result in more food produced in the United States than can be consumed domestically. How to get rid of the extra products? Exporting. But, under current World Trade Organization (WTO) rules, a domestic policy that results in agricultural producers receiving a higher price for their goods than what they would on an open global market (essentially the outcome of a subsidy in response to a retaliatory trade tariff) would likely enter into the category of “production-distorting” domestic programs, and could be either disputed in WTO courts or potentially invite additional retaliatory actions by other trade partners. What’s the solution? Well, open markets within which any indications of market failures (i.e., inefficiencies that may require policy action) and their solutions are carefully researched and implemented. 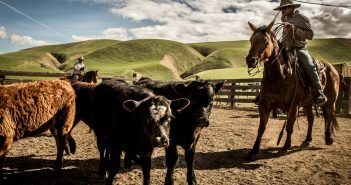 As Senator Steve Daines (Rep–Montana) noted, American farmers and ranchers “don’t want a handout. They want access to markets.” American consumers want that as well. Anton, I believe a word was left out of first bullet point. I think lower or decrease should have come before demand. Bruce M.